There are dozens upon dozens of cruise lines lines and hundreds of cruise ships - each with sizeable crews. Which job and company is best for you? Before coming up with a job search plan you should join CruiseJobFinder. We have interviewed dozens of current and former cruise ship workers as well as hiring managers with cruise lines, staffing partners, and concessionaires. See what an experienced Disney Cruise Line crewmember had to say about his experiences at sea! Joe L. lives in the UK. 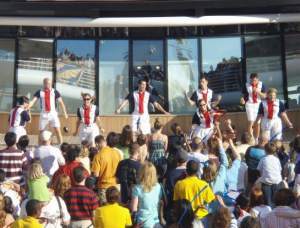 For two years he worked as a Entertainment Host for Disney Cruise Line (DCL). Prior to DCL he obtained a BA in Media Production and worked in children's / youth TV and sports coaching. Joe was also a local youth group leader and did some presenting and hosting work with Border TV and other corporate projects. This is Part I of II. The second part discusses what it's like to work on a cruise ship. I had worked in a youth club and on camps but I think mainly my experience in children's television was what suited me best for the Disney ship. It was a family audience and just like a kids' show most of the time. I had been on television, written scripts and knew the tone of entertainment they wanted. I didn't have any holiday park experience, just some live and television hosting experience. Cruise ships have so many industries in one place - food / beverage, entertainment, activities, merchandise - there is not much experience that can really prepare you. It's different to all others. Did you apply for this job specifically or for several different opportunities at once? I applied for an entertainment position - I didn't know much about the roles that were available, or what they encompassed. But I wanted to host events and be in front of the crowd. What were the employer's job requirements? The jobs were open to anyone with entertainment experience, whether in comedy, singing, musician, magician, or just experience working with and entertaining children. I wasn't aware of any particular qualifications or experience - it was very much based on your personality. Not many, but they asked if they thought I could "take it" or would I feel like jumping ship and quitting if it got tough. How long did it take from applying for the position to getting your first contact? The whole process took about six months. They got back to me instantly to say I had been successful and was on the list for the job, but then I had to wait for an opening on the ships to come up. I got a phone call asking me if I could fly out about a week before they needed me, and I had to begin packing there and then - it was just good timing that I was at the end of a TV contract. You have to drop everything and just go when they call. Did you receive any special training or preparation? That was perhaps the toughest part of working on the cruise - no preparation! And the information that you do get - especially for the Disney ships - cannot prepare you for what happens day-to-day. Even though I loved it and embraced it, I went on to the ship quite unprepared - I was sent on a flight still unaware of exactly what I would be doing. After a two-day training session about safety and history of the company, I was on the ship. I think in a way it's the best way to learn - you just have to get on board and settle in - not much can really prepare you for the role I did. Describe the living arrangements and how you dealt with sharing space. I lived in a small cabin in the decks sea level and below, which I shared with a roommate in the same sort of department. We had everything we needed, phone, bathroom, shower, and TV/DVD player - just in smaller cabin than the guests had. It was fine for me, tight at times, but I loved having a roommate and an environment similar to university halls.